Chaharmahal and Bakhtiari Province is one of the 31 provinces of Iran . It lies in the southwestern part of the country . Its capital is Shahrekord . The province was put as part of Region 2 upon the division of the provinces into 5 regions solely for coordination and development purposes on June 22nd , 2014 . It has an area of 16,332 square kilometers , and had a population of 895,263 in 2011 . The history of the province is tied to that of the Bakhtiari tribe . The Bakhtiari tribe can be divided into two sub-tribes , Haft Lang and Chahar Lang with various territorial affiliations and they are the main speakers of Lurish language . As the name of the province dictates with the combining grammatical feature of "-o-" which is Persian for "and" ; the other group of peoples in this ancient province are the Chahar Mahali's . These peoples and the Lur's live side by side and share almost similar customs . Very slight differences exist between them but most are almost unnoticeable . However there is often quite a bit of intermixing of the peoples through marriage . 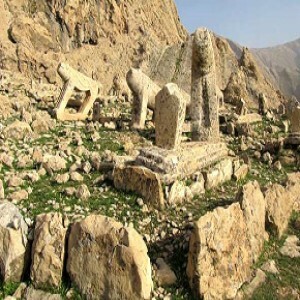 The cities of Shahrekord , Broujen , Ben , Naafch and Saman fall in the Chahar Mahali area of the province and are generally not inhabited by Lurs . The Bakhtiari territories at times have also come under Isfahan and Khuzestan province . The people of this province have a history of having a simple living and being a capable people who are determined and effective warriors and fighters whenever circumstances made it necessary . They have gained such a reputation as being excellent , if not the best , horsemen in Iran . The people of this province , while having the more common Pahlevani wrestling/combat style of the deep rooted traditional Zurkhane , which exists everywhere in all provinces , also have their own style of wrestling/unarmed combat as well (as do other provinces) . The style is called Jangi (Jang means War and hence Jangi "war'ish" or "war like") . The province has various unique traditions and rituals relative to the 'tribal' lifestyles . Special forms of music , dance , and clothing are noteworthy . The province is mainly active in the agriculture sector . Most of the industrial sector is clustered around the center of the province . The province has the potential to become a vibrant tourist attraction because of its natural resources .